Remember, or rename the generated document to something you can remember. Open a new blank document. In the event that you want to serialize an accessory that does not arrive with a serial number, ROSS can generate those serial numbers for you. Import into your favorite label printer or mail merge program. If you do not use Google Docs, LibreOffice is another free alternative but is notably harder to use. 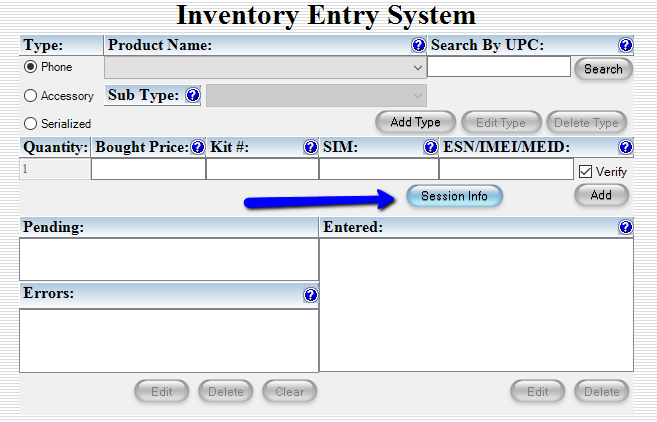 Add inventory allows you to add any type of inventory into ROSS. 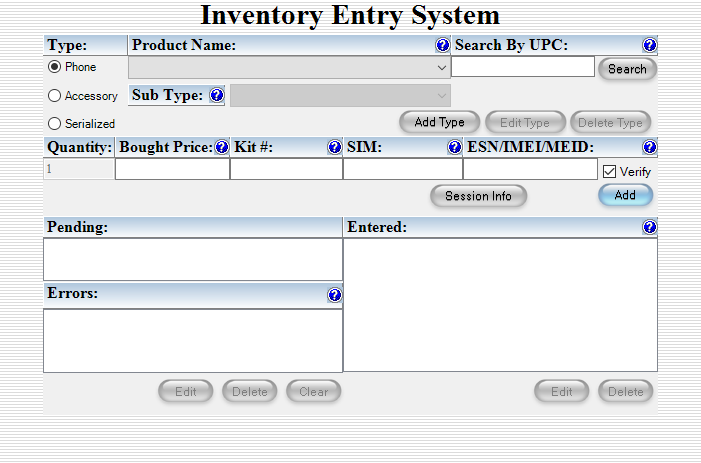 The main types of inventory are Phone, Accessory and Serialized. It is important to note that “Accessory” can be a little of a misnomer as it encompass any line item you want to track that is not serialized in some way, including accessories, activation fees, service fees, e911 fees, etc. Welcome to the ROSS Issue Log! If ROSS is experiencing any difficulties, we will keep you up to date on this page as to the problem, our progress in working towards the solution and any instructions you may need to follow to assist us in the process. Bookmark this page and visit it first if you experience a problem when working in ROSS. If the problem is not listed below, please send an email to our support team at support@tryross.com. In the event that the problem you are experiencing is listed below, please continue to check for updates until it is resolved. When logging in and out of ROSS, some people are experiencing an “invalid token” message. If you receive this, close ROSS completely, open it and log in again. The following video overview of ROSS is a bit dated, but gives a great foundation for how to use ROSS. Direct Fulfillment is when a carrier or master dealer sends equipment directly to the customer instead of the customer walking out of the store with it. This is not intended to be a technical reference, providing a term’s exhaustive meanings and implications but more of how a term is used in the mobile industry or within ROSS. 3G – Third Generation mobile network. What is 3G or 4G is a very gray line, and somewhat subjective. 4G – Fourth Generation mobile network. What is 3G or 4G is a very gray line, and somewhat subjective. Access Fee – Charge imposed by telecom provider to access their network. Accessory – Something sold in relation to a mobile device. In ROSS, this can be something physical like a car charger or case, or not such as tech service, prepaid service or bill payment. Addon- A service that is attached to a phone plan that is not specifically part of that plan. This could be anything from SMS or Internet usage to an insurance plan. Affiliate – A company that helps a carrier expand their service area, usually by branding themselves as the carrier and adding towers to their network. Airtime – Time spent using voice service. Analog – Older mobile network technology. Analog signals tend to be on much lower frequencies, and thus can cover much greater areas. Analog signals are also much more tolerant of transmission loss. Because of these two attributes analog is still used in a few areas with much less population density. Android – A Mobile Operating System originally developed by Google. Google advertises this as open source, which while technically true, official releases are on a very controlled (read closed) platform. App – Short for Application, and in the mobile industry means a program that runs on a mobile device. Bluetooth – A very low range wireless signal. This is usually used for connecting accessories such as Bluetooth Headsets to a mobile device. Brick – A mobile device that is no longer functional. Usually indicates that it can not be easily repaired. Broadband – A mobile network connection that allows you to transmit multiple types of data (such as voice and internet) simultaneously. Buydown – A commission paid on a physical phone when activated on a specific service. Carrier – Company that provides mobile phone service. CDMA – Code Division Multiple Access – One of the two major mobile Digital network technologies. In the US, primarily used by Sprint and Verizon. Cellular – A technology that allows a device to maintain connection while moving by “Handing off” the signal to different towers. By some definitions Cellular is no longer accurate in the mobile industry, but it is widely used for legacy sake. Clamshell Phone – A phone that opens on a hinge in which both hinged portions are roughly the same size. Not to be confused with a Flip Phone despite that many times the term is used interchangeably. Clamshell – Single piece retail packaging that closes around the product from a hinged point. Usually has a hole to enable the product to be displayed on a retail hook. Usually is clear to allow the product inside to be seen. Dual Band – Generally refers to a phone that can operate on multiple frequencies. ESN – Electronic Serial Number – A unique number assigned to a mobile device that identifies it when connecting to a mobile network. An ESN is specifically attached to the users service. An ESN is usually expressed in decimal, but can often be found in Hexadecimal as well. Global Phone – Another term used synonymously with World Phone. GPS – Global Positioning System – A technology on phones that uses satellites to determine your position on the earth. Often used with Apps for navigation or social interaction. Gross Profit – Total profit made within certain requirements. Unlike most retail industries, mobile sales often take a loss on the actual Point of Sale Transaction. Gross Sales – Total amount of sales with a given requirement. Often expressed in units, points or dollars. GSM – Global System for Mobile Communication – One of the two major mobile Digital network technologies. In the US, primarily used by T-Mobile and AT&T. Hands Free – Method to use a mobile phone without holding it to your head. Primarily a wired or wireless headset. Jailbreak – To remove restrictions replaced on a mobile phone by the carrier or manufacturer. Generally refers to iOS. Root is the term generally applied to Android. M2M – Machine to Machine. Communication between devices over a mobile network, not requiring the interaction of a person. Examples could be Payment Processing, equipment monitoring, inventory tracking etc. Master Dealer – A company that works directly with a carrier and coordinates other companies (Sub Dealers in an indirect sales channel. MEID – Mobile Equipment Identifier – A unique number assigned to a mobile device that identifies it when connecting to a mobile network. An MEID is specifically attached to the users service. An MEID is different from an ESN in that it is a global standard, and is thus unique globally. MEID is usually expressed in Hexadecimal. mHZ – Megahertz – the term used to express the frequency of a wireless device or mobile network. MMS – Multimedia Messaging Service – The ability to send Media files (usually video or photos) between phones. Mobile – A wireless technology that allows you to change locations without loosing access. Mobile Hot Spot – A mobile device that allows you to share your internet connection with Wi-Fi Devices. Postpaid – Agreement with a Carrier in which the user pays for service at the end of the usage term. Often requires that the user has acceptable credit thus requiring a credit check before activation. Prepaid – Agreement with a Carrier in which the user pays for service in advance. iDEN – Integrated Digital Enhanced Network – minor mobile network technology developed by Motorola. Primarily known for it’s built in support of both standard mobile communication and a two way radio, and used in the US primarily by Nextel. IMEI – International Mobile Equipment Identity – A unique number assigned to a mobile device that identifies it when connecting to a mobile network. 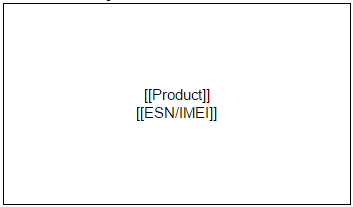 Unlike an ESN, an IMEI is not specifically tied to the user’s service, but instead relies on a SIM which is. Indirect – A Sales channel that is not owned and operated by the Carrier themselves. iOS – A Mobile Operating System developed by Apple. Used primarily in the iPhone, iPad and Touch iPod devices. MVNO – Mobile Virtual Network Operator – A mobile service provider who uses other providers’ frequencies and towers primarily, but usually exclusively. QWERTY – Keyboard layout that mirrors a standard US keyboard allowing for much faster user input. Roaming – Using a cellular tower that is not part of your |Carrier’s Network. Historically this could also mean using a tower that is outside of your |Carrier’s specified range for your plan as well, but this is less common these days. Root – To remove restrictions replaced on a mobile device by the carrier or manufacturer. Generally refers to Android devices. Jailbreak is the term generally applied to iOS. SIM CARD – The physical card tthankshat a SIM is contained on. Sub Dealer – An indirect agent that works under a Master Dealer instead of directly with the Carrier. Wi-Fi – Wireless Fidelity – A standard wireless network technology, often meaning wireless internet access. World Phone – A phone that can be used on international networks. US Networks generally do not follow international standards, usually in the frequency range. Make the back button after setting filters on carrier data import function correctly. When importing columns with duplicate headings, append a number to avoid errors, and allow importing. Allow users to specify that there is no header row. Add an “All” option to payment status when importing ROSS Data, so users who want all don’t have to run the wizard twice. Add a processing graphic and disable form when processing typed in cards through ROSS. Set the next button as default when typing in cards processed through ROSS. Rebuild theme to have a lighter and cleaner feel. Set Main customer’s tab to link to the search. In Gross Profit Report 2, fix which rep exchanged phones are attributed to. Currently this report counts the return toward the original rep, and the new item toward the new rep. Numerous requests have come in stating that the expected behavior is to have the new item also credited to the original rep. Allow TryROSS.com users to update their own billing information and password. Add the ability to make important intranet messages archive when they are deleted. Add the ability to add custom payment types. Payment types will work like cash, but have custom names. Add the ability to edit the time in transaction view along with the date. Fix – In some instances exchanges are staying marked as returns. Add the ability to handle international currencies. Make the task menu on the left panel permission based. 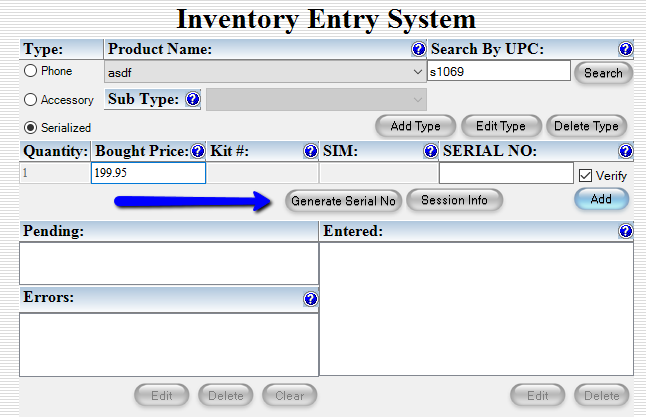 Add fixed numeric labels to the stores chart..
Set the main customer’s tab page to redirect to the customer lookup. Add the ability to read entries from “customer notes” on the main customer page. In retail.cs, there are a lots of address parsing functions. Move them all to their own class and update any references to them. When processing credit cards through ROSS, add the auth method (swiped or typed) to the receipt. When processing credit cards through ROSS, add the auth code to the receipt. Add Advanced employee dropdown box to transaction search. Add the ability to process E-Checks through Authorize.net. This feature requires it’s own Authorize.net account, meaning it can not use the same Authorize.net account as credit cards. This is a restriction of Authorize.net and we encourage contacting them and filing a request to change this. Add Tasks section to ROSS. This allows you to schedule tasks for yourself and anyone you manage. Tasks can have sub tasks, and can be set to reoccur. Add Option for users to generate coupon codes to give them referral bonuses. Specifically target x86 Processors so that mag stripe readers can be recognized on both 32 bit and 64 windows systems. Add the ability for ROSS customers to add connections without contacting New Covenant Software. To add connections go to log into TryROSS.com and choose “Add Connections” on the left hand side. Add ROSS Support Wiki and build initial content. Resolve Branding inconsistencies in Carrier Scrub. When accessing TryROSS.com redirect to secure server directly to avoid cookie clash when paying invoices. Make setup no longer per connection, but per account. Old plan options will no longer be available beginning February 1st 2011. Add emergency support line to phone system. Update Employees tab (Employee Rankings) To use employee dropdown box that separates out inactive employees. Build tools for ROSS Customers to generate custom coupons for friends earning them referral bonuses, and saving their friends money. Add option to disable just the connection overage Emails. Currently to do so, you must contact New Covenant Software. Fix plans and addons sub-folder propagation to sub dealers. Fix plan and addon propagation to inactive sub dealers. ROSS was built from day one to take the mundane work off your sales rep so that they can do what really makes you money, SELL! You no longer need to hire computer savvy sales reps or spend days training them how to use your system. ROSS walks your sales reps step by step through every sale. For an accessory, a full transaction can be performed in under a minute. Phone sales can be performed in about two. ROSS will automatically know what actions you may want to perform. Direct Fulfillment? No problem One simple button and you are moving! You transfer it between three locations before you ever even sell it. With a simple lookup, you can see all that has ever happened to it, and this information will be available to you forever. If a phone should get lost, you can track every step it made! Four score and seven… Oh wait! Wrong message. Being developed exclusively for the cellular industry, ROSS has a compilation of nearly every report type needed for day to day operation. We focus on giving you high level reports that can enable you to manage hundreds of stores, and then give you the ability to drill down to see every last little detail. If you find yourself missing a report that you need, contact New Covenant Software. If it does not already exist, they can issue a quote for building it. Give every employee in your company important notifications first thing when they log in. Have employees communicate in a message board to share selling tips or other creative ideas. Because we know we have the most affordable solution for cellular retailers and our goal is to develop a long term mutually beneficial relationship we do not hide our pricing from you. We are so confident that you will love our software that there are no time commitments, you may cancel at any time. Connections are how many users you can have logged into a system simultaneously. In theory you could run a dozen stores off of one connection, but that would not be practical. We generally recommend setting up one connection per location (or more if they are high volume) plus one connection per full time headquarters staff person. I just got a new computer, how do I set ROSS up on it? To download ROSS go to TryROSS.com. About 1/2 way down the page you will see a button for “Download Demo”. Right below that there is a link that says “Download full version”. Click this, download and install the most recent ROSS version. After installing, ROSS will prompt you for a CD-Key. If you have access to the TryROSS username and password, you can click “Get Key” on the lower left corner of the CD-Key dialogue and generate a key right there. If you do not have access to the TryROSS username and password, contact your manager to obtain a CD-Key for you. I am getting a time out on ross? How to resolve this? When you have a firewall/antivirus program like Norton or Mcafee that is trying to scan the traffic that ROSS is sending and receiving You are going through a proxy server. If you are not aware of using a proxy server that can be a sign that you have a virus. In essence what the root error is saying is that the data has been tampered with. All can be found through a quick google, or following the links above. Is ROSS available on Mac, iPhone, Android etc? ROSS is developed for PCs, but using the LogMeIn Free service from LogMeIn.com, you can access it on most other platforms. Visit the Appstore and search for LogMeIn. There is a $30 app you will need, then you can be off and running. Visit the marketplace, search for LogMeIn. With this $30 app you can be off ROSS-Droiding! I received the following error, what can I do? This means there is some sort of break in the line between your computer and our server. That simply needs to be restored, but diagnosing it can be difficult. The most common issue, and especially If you have just installed ROSS is a firewall. Make sure that all firewalls (Windows, Norton, McAfee etc.) on your computer and internet equipment (Router, Modem etc) are configured to allow ROSS through. If they appear to be, you can attempt disabling the firewall completely. If that works, please consult your network admin for reconfiguration. Next, try visiting https://machine1.newcovsoft.com. If you are unable to access this, try rebooting your Modem, Router and computer (in that order). If you ARE able to access that, there is something specifically blocking your the ROSS Software. Since you have eliminated any firewalls issues, it is most likely some form of malware. Please contact your Computer administrator for further diagnosis. 98% of the time this is because the date is set incorrectly on your computer. Most common is the year. If the date IS set correctly, then you could be missing a security certificate or have malware on your computer. Please contact your computer administrator. Connections are like phone lines on your server. When they are all used up, you don’t have the ability to make another call. This is usually resolved by having another user log out. If you are certain that there are not too many users logged in, the account holder can log intohttp://www.TryROSS.com and terminate existing connections. If a computer stops communicating with the server without logging out, it’s connection will be automatically terminated in 5-15 minutes. Charge Your SmartPhone…by Shouting at It? Smartphone Kill Switch: A Solution or Just a New Problem?